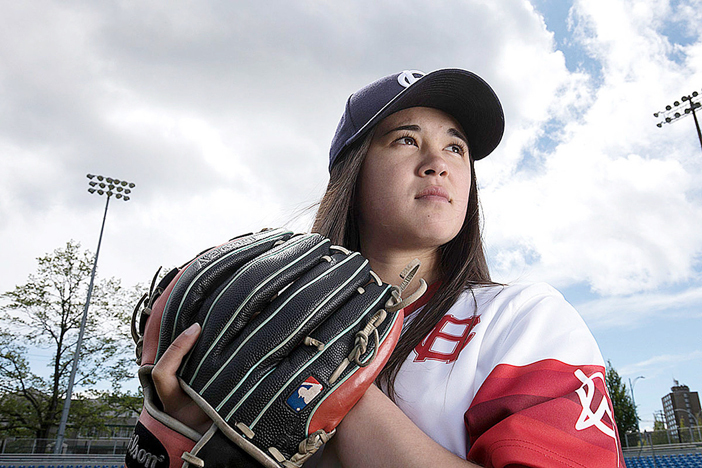 Nikkei knuckleballer Claire Eccles makes history as the first woman to play in baseball’s West Coast League. Brad Norris-Jones had everything all planned out for Wednesday night’s Victoria HarbourCats baseball game in Canada’s British Columbia. The team general manager had his photographers in place, he had set his viewing spot. A handful of staff were even assigned to retrieve the ball after one particular pitch. The moment came, and all the preparation went out the window. That’s correct. She threw a strike. Aside from the umpire, the GM was likely the only one at Royal Athletic Park who was paying any attention whatsoever to balls and strikes. The focus of the other 1,200 others in the house was squarely on relief pitcher Claire Eccles, who took the mound and became the first woman to play in baseball’s West Coast League. Eccles, a 19-year-old lefty knuckleball specialist, was signed by the HarbourCats last month. She admitted to feeling a few butterflies in her debut, as she entered the field to a roaring crowd. “It was pretty surreal, walking in from the bullpen and hearing the crowd and my teammates supporting me,” she said after the game. It didn’t take long for her pitching senses to take over the conversation. “I wish I didn’t walk a guy, I wish I didn’t hit a guy,” Eccles said, after her team was on the short end of a 9-0 loss to the visiting Wenatchee AppleSox. In her two innings, Eccles allowed two earned runs on a hit. The score and her stats are destined to become an all but meaningless historical footnote. Eccles grew up in Surrey, B.C., southeast of Vancouver. She recently wrapped her sophomore season at the University of British Columbia, and played in the outfield for the softball team. However, she’s far more at home on the larger diamond. She pitched for the Canadian national team last fall, at the 2016 Women’s Baseball World Cup in South Korea, helping her squad take home the silver medal. Her athletic ability showed early on, as she excelled in basketball as well, even garnering a few college offers along the way. She wasn’t interested. After she became enamored with a video game called “Backyard Baseball” as a small child, Eccles’ parents signed her up for tee ball. She learned the ins and outs of the game, then proudly proclaimed to her parents that she would someday play in the Major Leagues. She was heartbroken to learn that women didn’t play men’s baseball. Or maybe, just maybe, she was motivated by that idea. Years later, it was her mother, Melodie Tomiyama, who suggested giving competitive softball a go, as the boys were getting pretty big. “I was around 13 at the time, and I just remember thinking, ‘This is okay, but I’d rather play baseball. I like to pitch,’” she explained. Playing among the boys in Little League, the lefty quickly discovered that she had a rare talent that has been the basis for many a storied career in baseball. In high school, Eccles was introduced to a provincial women’s baseball program, and by the age of 16, she had earned a spot on Canada’s national team. In addition to pitching in the last two Women’s World Cup events, she appeared for Canada in the 2015 Pan Am Games. It was those performances – including a complete game victory in South Korea – that eventually caught the attention of Norris-Jones and the HarbourCats. After a quick phone introduction and an informal meeting at a local coffee shop, the fit was clear. The West Coast League is an 11-team circuit, spanning Oregon, Washington and British Columbia. It is strictly a development league, committed to preparing talented college players for the next level of their careers. Among the WCL’s alumni are eventual major leaguers Stephen Fife of the Dodgers and Jacoby Ellsbury of the New York Yankees, and current UC Irvine star Keston Hiura. The HarbourCats have said Eccles will receive no special treatment, that she will need to complete for playing time – just as any other player. The response has been anything but ordinary, however, with intense media attention and a howling fan base, cheering with every pitch at her first game. Eccles fully understands her role, and has a firm grasp on realistic expectations. She’s the first woman to play in this high-level men’s league. She gets it. Her name will undoubtedly be added to the legendary roster that includes Ila Borders, Toni Stone, Lizzie Murphy and Eri Yoshida. She further realizes that she will represent countless unheralded women who have shown they’ve got what it takes to compete with the guys. She’s pegged as a knuckleballer, but will also toss in a surprise fastball and her curve has been described as well above average. Challenge seems to be a springboard to success for Eccles. She explained how her hometown has a not-so-savory reputation, but she debates any critics from the mound. “I’d just rather strike them out,” she said. Indeed, she would appear to be taking her place on the team without much personal fanfare. She asked friends and fans via Twitter what her walk-on music should be when she enters the game (“Hollaback Girl” by Gwen Stefani seems to have been the favorite), and there have been at least a few runs to the local drug store for nail hardener – a knuckleballer’s best friend. Eccles’ favorite MLB player is Ichiro Suzuki, and she got quite a kick out of a message of congratulations from Atlanta Braves knuckleballer R.A. Dickey. At the recent Japan Night at Dodger Stadium, former Dodger and Yankee starter Hiroki Kuroda was delighted at the news of her signing. “Kakkou ii! (Cool! ),” Kuroda said, opening a broad smile. Off the field, Eccles seems firmly rooted in community and family. She explained how her grandparents suffered the same fate as more than 120,000 Americans of Japanese ancestry here in the U.S., as they were rounded up and incarcerated during World War II. Her grandmother, Takaye, was born in the town of Steveston, British Columbia, which historically has had a substantial Nikkei population. She was eventually interned at Canada’s first relocation center in Greenwood, B.C. Eccles’ grandfather, Aki Tomiyama, was confined at the camp in Fort Macleod, Alberta. 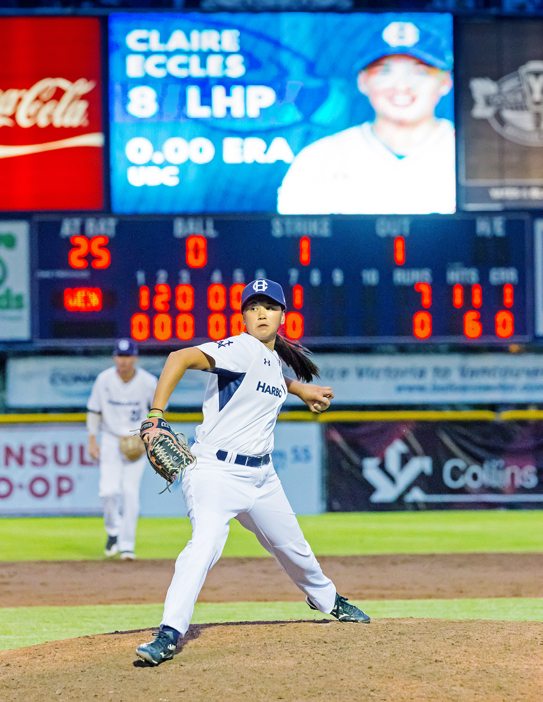 Eccles’ poise and grounding was on full display after her first appearance with the HarbourCats. She had said prior to the game that one of her goals was not only to exemplify how women’s baseball is growing, but to promote women in sport in general. Clearly, few have ever delivered such an important pitch.